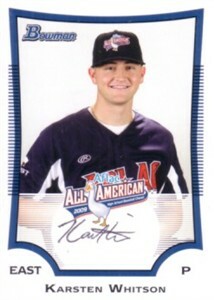 2009 Bowman (Topps) AFLAC High School All American Baseball Rookie Card of Karsten Whitson (AFLAC-KW) AUTOGRAPHED by Whitson in black ballpoint. Whitson starred for the Florida Gators. With certificate of authenticity from AutographsForSale.com. These cards were much tougher to get compared to previous years, each attendee received only ONE random card upon request, not 3 as in previous years. NrMt-Mt or better condition. ONLY ONE AVAILABLE FOR SALE.